of the MH50 model (81 in.) and the extended reach of the MH50-35 (100 in.) and MH50-20 (122 in.) robots make them ideal for processing large parts. In many cell layouts, these extended-reach models can eliminate the need for an external track, minimizing system cost and simplifying programming. Internally routed cables and hoses optimize reliability, minimize interference and ease programming. Payload ranges from 44 to 110 lb. Wide work envelopes with small interference zones allow the MH-series robots to be placed in close proximity to workpieces and equipment, reducing floor-space requirements. 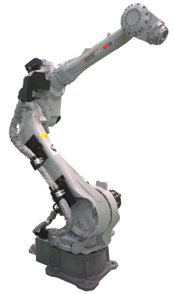 The robots have brakes on all axes and can be floor-, wall- or ceiling-mounted for layout flexibility. The MH50, MH50-35 and MH50-20 robots use Motoman’s dynamic, next-generation DX100 controller that includes patented multiple-robot control technology to easily handle multiple tasks and control as many as eight robots (72 axes), I/O devices and communication protocols. The DX100 uses a Windows CE programming pendant with color touchscreen.